Einar Falur Ingólfsson (1966) in an Icelandic photographer and writer. For over a decade he has worked on a few long-term artist‘s projects which have have been exhibited in various forms in museums in Iceland, other European countries and the US. A couple of his projects have been published in acclaimed books; Saga-Sites – In the Footsteps of W.G. Colligwood (Crymogea, 2010) and Land Seen – In the Footsteps of Johannes Larsen (Crymogea, 2017). In these two projects he followed in the footsteps of two foreign artists who visited Iceland, in 1897 and 1927/1930, to illustrate in personal artworks sites mentioned in Sagas of Iceladers, written in the 13th Century. Einar Falur used their work as „a guide“ during his own long and personal journeys around Iceland, working with a large-format camera. In the last few years Einar Falur has also worked on a long-term project about people and infrastructure in the Icelandic higlands, of which the first part was exhibited in 2018 in Reykjavik Art Museum. 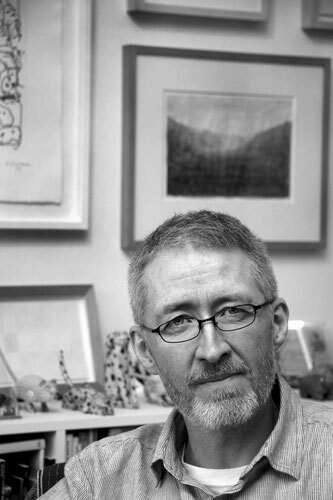 Einar Falur‘s background lies in journalism and visual arts. Born in the fishing town of Keflavík, he moved to Reykjavík, the capital of Iceland, when he was 19 to start working full time as a photographer for Morgunblaðið, Iceland‘s main newspaper. While photographing for the paper he served another passion of his youth and studied literature at university. Having finished his studies he was to become a culture-journalist at the paper, while continuing educating himself in photography, working with some of the masters of the medium is his country. Influenced by American photographer Mary Ellen Mark, who he had met and befriended in France in 1988, Einar Falur moved in 1992 to New York where he was to get his MFA in photography at School of Visual Arts. Later, in 1995, he was invited to take up the post of director of photography at his old newspaper in Iceland, a position he held until 2007 when he decided to concentrate on his art. Currently he is the culture editor of Morgunblaðið but has also been working constantly on his art and has partticipated in solo and group exhibitions in museums and gallery spaces in Iceland and abroad, f.i. in Denmark, Germany, New York, Russia, Switzerland and Finland. Einar Falur has lectured widely on the arts but mainly on photography. He tought annual workshops in Iceland with American master Mary Ellen Mark and holds a part-time teaching post in The School of Photography in Reykjavik. While in Circolo Scandinavo in Rome Einar Falur will work on a yearlong personal photographic project-cycle which started when he spent a month in Varanasi in India last year. After Rome he will continue the project in Iceland for a couple of months, from there it will take him to Egypt and the cycle will finish where it started, in India.